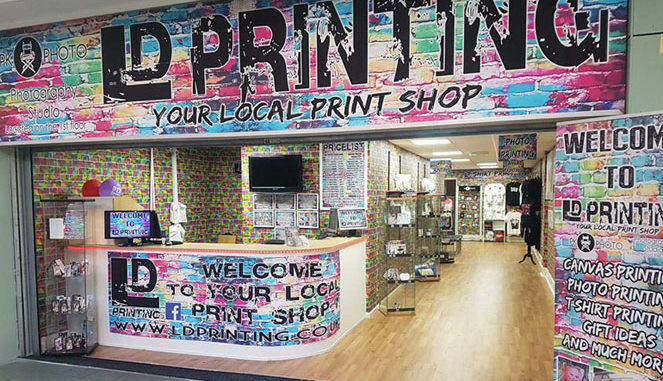 LD Printing's new shop in Dundas Shopping Centre. A Middlesbrough shopping centre has achieved 100% occupancy with the letting of new unit to a local printer and photography studio by Teesside independent commercial property consultants Dodds Brown. All 20 retail units at the town’s Dundas Shopping Centre are now occupied – in contrast with vacancy rates for retail units nationally which stands at 12.1%. The letting comes hard on the heels of Middlesbrough Council taking a five-year lease on unit 11 in the shopping centre, along with 19,820 sq ft of space at Dundas House, the office building located about the shopping centre, for a wellbeing centre. Low cost printer LD Printing has taken the ground and first floor of unit 8 in the Dundas Shopping Centre on a new five-year lease. The company is moving from a unit in the adjoining Dundas Indoor Market where it has successfully traded for the past four years. LD Printing supplies personalised gifts, canvas prints and other bespoke printed products and has just opened a photography studio to supply professional photographs. Growth in the business has prompted the move. Richard Wilson, senior associate partner at Dodds Brown, acts as letting and managing agent for Dundas Shopping Centre for centre owner Contract Experts. He said: “Achieving 100% occupancy at the Dundas Shopping Centre is a remarkable achievement, especially in the context of rates of vacant units elsewhere. “Dundas Market, Middlesbrough’s only indoor market, has a great track record is supporting local independent growing businesses. “In addition to LD Printing, the Festival Shop, Tik Tok, Homefair Blinds and Buckshees Military Surplus all started in Dundas Market and have subsequently grown and moved into shops in Dundas Shopping Centre. “Town Centre retail in general has had a difficult few years with a reduction in the number of requirements from national retailers. There are still a number of units still available in Dundas Indoor Market with rents starting from just £60 a week. Further information is available from market manager David Harris on 01642 232552 or by email. david.harris@dundasindoormarket.co.uk or from Richard Wilson at Dodds Brown on 01642 244130.